People like compact sedans. These have a three-box styling, their hatchback derived form makes them easy to drive and the compact dimensions make them ideal for the ever-tightening cosmopolitan spaces. And since it's been a decade since the birth of the genre, compact sedans of today are more refined, improvised and even quite premium in their appeal. The front-runners have evolved to now offer the frugality of a diesel motor with the convenience of an automatic transmission. 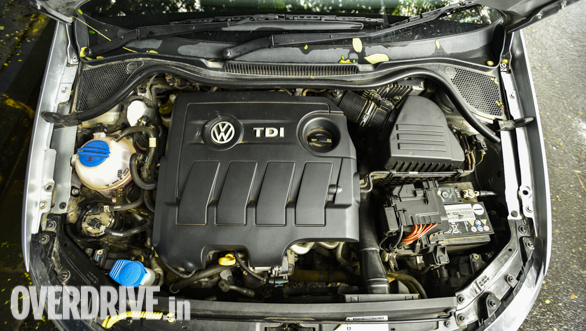 Here are three of the best diesel automatics that you can choose from in this space. 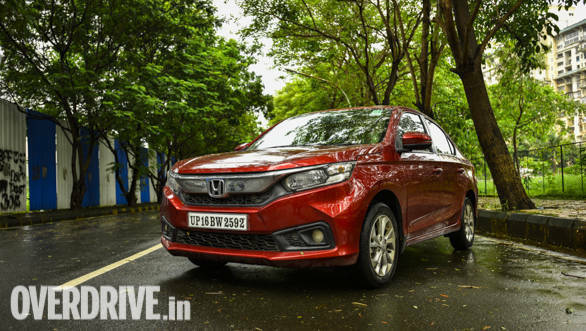 The newest kid on the block is the Honda Amaze. 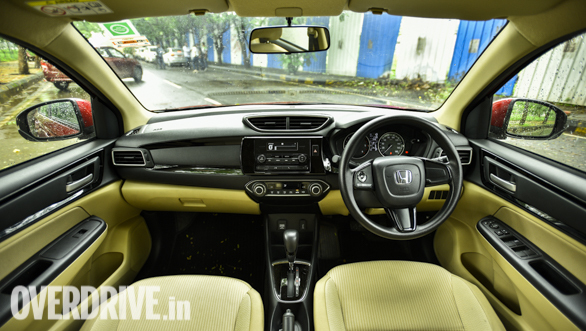 Now in its second generation, the Honda Amaze has improved by leaps and bounds and it now comes with a diesel CVT. 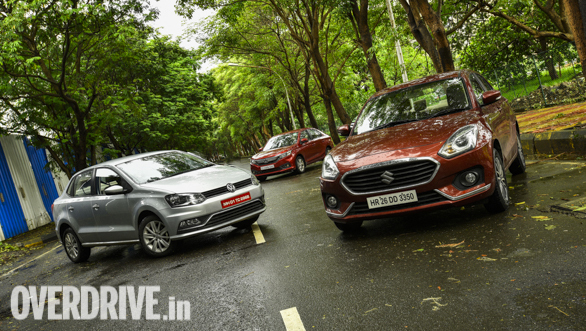 The Dzire, on the other hand, has moved into its third generation (and how!) and gets the latest AMT gearbox that is quite impressive. 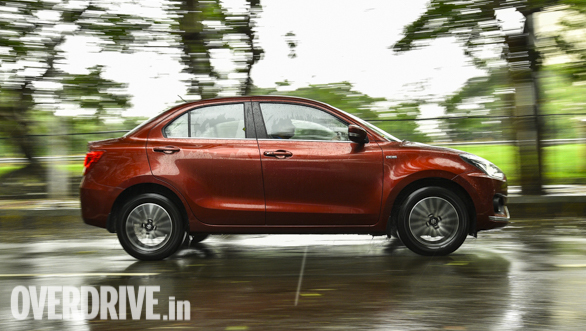 And finally the Ameo, which arrived late to the compact sedan party, but brought with it the lovely DSG transmission. 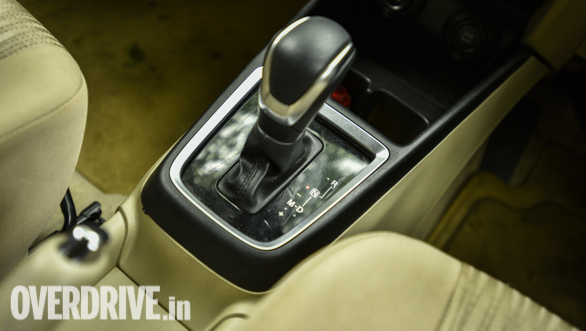 Let us begin with the Honda Amaze diesel CVT. 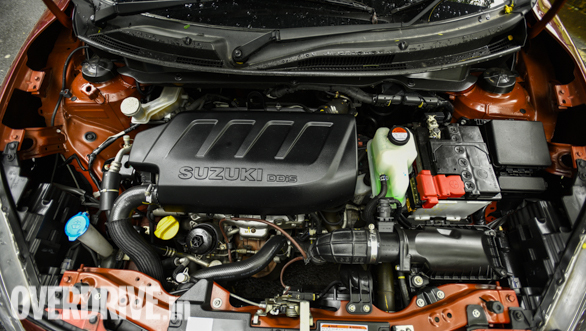 The frugal 1.5l i-DTEC diesel engine of the Amaze, which otherwise puts out 100PS and 200Nm, is detuned to 80PS and 160Nm for the CVT application. 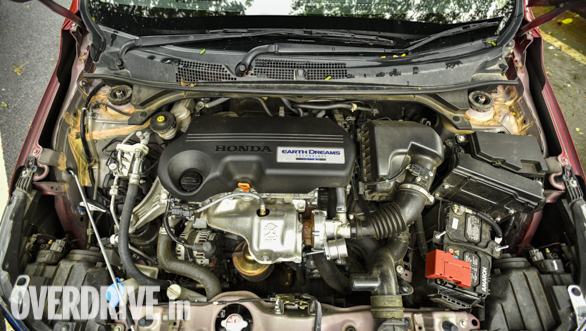 Honda says that the reduction in overall output was necessary to ensure seamless shifts and a reduction in the rubber-band effect that is inherent to CVTs. It works! In fact, the tuning works so well that you don't feel the torque deficit while driving in the city, and pulling overtakes isn't a problem either. The drivetrain also feels a lot more eager than what its on-paper figures suggest. It is only at highway speeds that the overtakes seem to take a while. The drivetrain feels effortless at highway cruising though, but the lightweight construction of the car makes it feel floaty at those speeds. If you are looking for a diesel automatic, chances are that you are subject to crowded city traffic quite often. That also means you spend a lot of time inside the cabin making its kit, look and feel all the more important. The cabin of the Amaze has been given a significant improvement in that department. The only complaint is the bare-basic infotainment system that you get in the lower spec trims, but otherwise, it doesn't feel like an entry-level car! 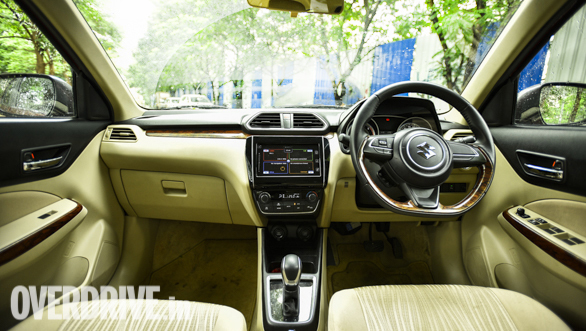 It is also quite spacious for a compact sedan and rear A/C vents would have been a welcome to make it a more pleasant place to be in. Honda has worked a great deal on the noise insulation and the drivetrain clatter has been cut down by a great extent. Over bad roads though, there is plenty of road and debris noise that you hear inside the cabin. The rear seat also has a loud booming sound at highway speeds, again highlighting the fact that this is more of a city car. That said, Honda has done a commendable job with the ride comfort and it is easily one of the best in this category. Speaking of the category, the Dzire leads the pack with its sales figures. Brand value aside, the success can be largely attributed to its premium feel on the inside and outside and the level of kit and space it offers in the cabin. It is the more feature-rich car of this test and boasts of equipment like Apple CarPlay/Android Auto, automatic headlights and rear A/C vents. 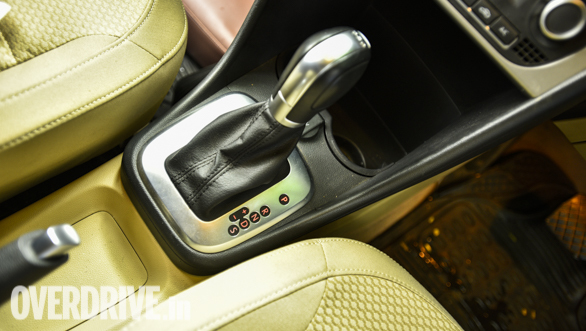 Amongst the three automatics tested here, the Dzire's AMT comes closest to offering the responsive feel of a manual transmission and that makes it quite easy to drive in the city once you factor in the pause between the shifts. That said, the 'shift-pause' has been reduced by a fair margin compared to some of the other AMTs around. Mash the throttle and the Dzire is also ready to drop two gears to build up speed, but like the Amaze, roll-on acceleration at highway speeds takes longer than you would expect. The lightweight construction of the car gives you the perception of speed, though this package is the slowest to the ton and also in its roll-on acceleration. The slower acceleration times are down to the engine being the least powerful of this test. The Dzire handles pretty well for a compact sedan too. But the lightweight construction also makes it feel a tad too light-footed around bends, especially with its skinny tyres. It isn't unnerving, but something you need factor in before engaging in some fun around twisty roads. 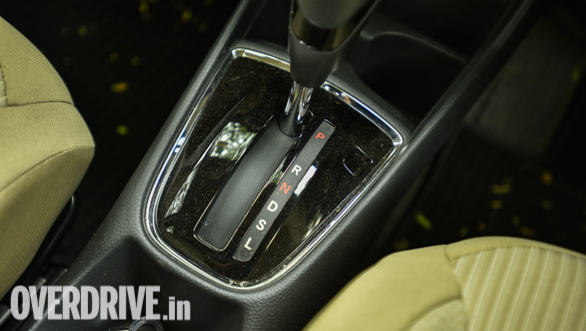 Oh and when you do, move to the manual mode on the gearbox. 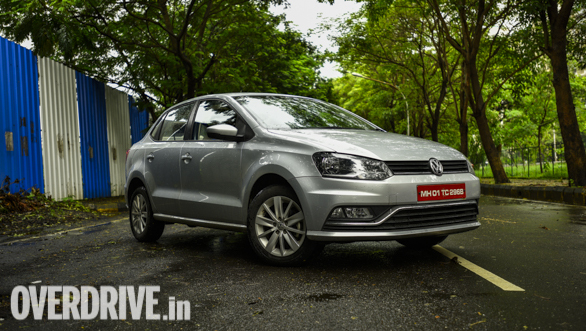 But speaking of handling and dynamics, its the Volkswagen Ameo that takes the cake. It has excellent handling characteristics and the ride quality is pretty impressive, despite the feeling of it being a bit firm. Hit the twisties, and you will be impressed at how little the body roll is compared to the Amaze or the Dzire. The heavy construction of the car makes it 'feel' sluggish, but it is on par with the Amaze diesel CVT in outright acceleration. It does impress further with the strongest mid-range acceleration of this test. While the DSG does feel a bit laggy to get off the mark, it gives you a meaty midrange. So while it may feel sluggish at crawling speeds, it pulls overtakes effortlessly and cruises calmly at highway speeds. 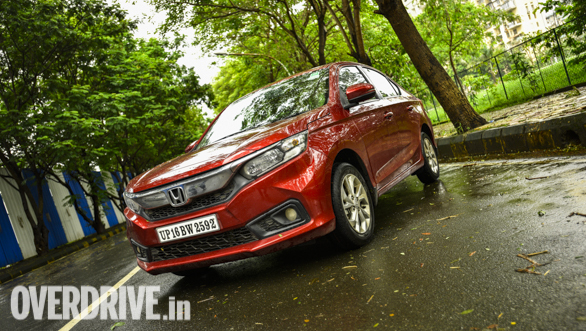 It also pips the Amaze on its highway economy, but the Honda is the more fuel-efficient car of this test, overall. 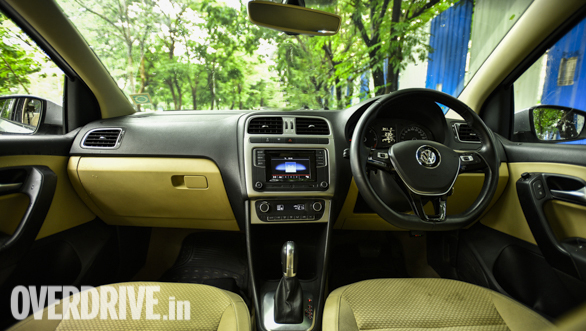 The cabin of the Ameo is quite pleasant and looks and feels upmarket. The only fly in the ointment is the rear seat comfort and space and makes this car an ideal choice for couples or nuclear families. Ironically, it misses out on isofix child seat mounts though. 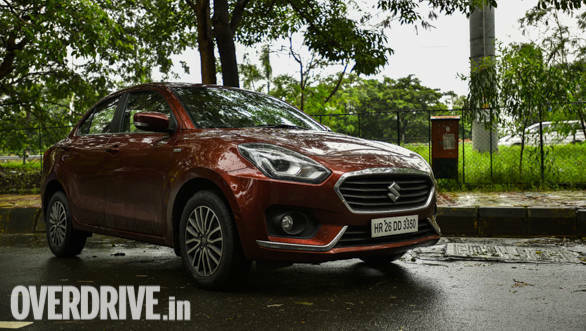 Like the Amaze and the Dzire, it gets ABS and dual airbags as a standard fitment, but trumps the two with the inclusion of adjustable head restraints on all seats, and by featuring an electronic stability program on the DSG variant tested here. All the three cars are quite closely matched in their overall appeal and each has their own facets to boast of. The market leader, the Dzire, has clearly bumped up its premium quotient and that reflects in its class-leading sales. But speaking of a premium feel, it is hard for these Japs to trump the German fit and finish and the look and feel of the Ameo. 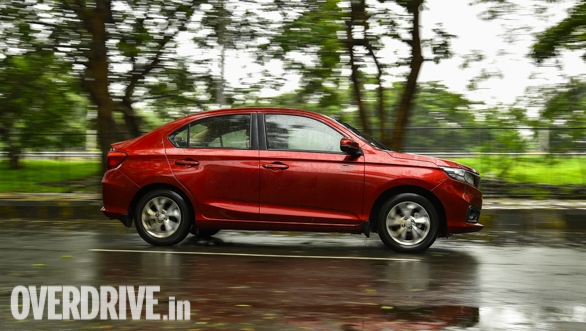 However, this comparison primarily focuses on the frugality of a diesel with the convenience of an automatic and in that regard, the new Amaze kicks the ball out of the park with the diesel CVT. The Amaze has leapfrogged over its predecessor in terms of its quality, kit, and performance, and the drivetrain is simply hard to find faults with it in this space. 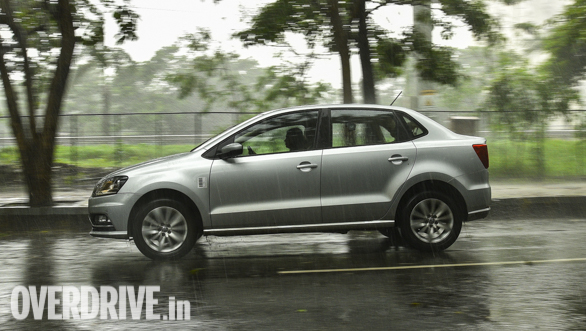 With those attributes working for it, the Amaze diesel CVT is the clear winner of this test.